Never use lighter fluid again. Before I began working at Weber there was only one way I knew of to light charcoal. Make a big pile in the center of the grill, soak it in lighter fluid, and light it up. I think that’s how most charcoal grillers start out, but not only is lighter fluid pretty dangerous stuff; it can also leave a nasty flavor on food. and why are they so great? First of all, the Rapidfire Chimney Starter has a very simple design. 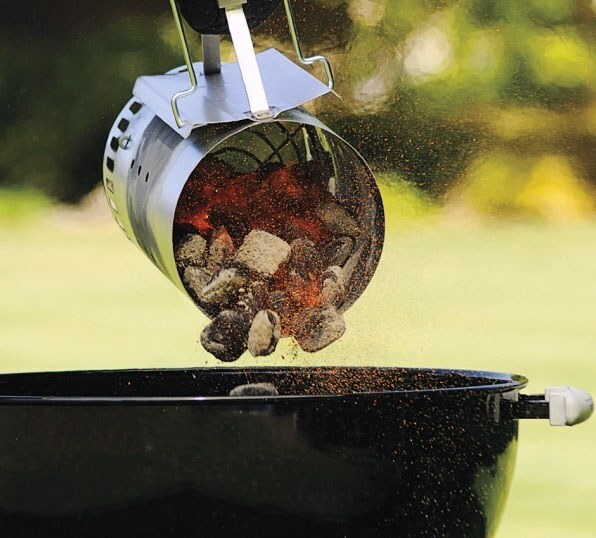 It’s basically a hollow metal cylinder with holes on both ends, a small wire grate inside, and a set of handles to hold the starter and to pour the charcoal. Using one couldn’t be easier. You can use either newspaper or lighter cubes to get the coals going. Newspaper works great, but nothing beats a lighter cube. They even work in the rain! I prefer to use two at a time to get the coals burning even faster. You’ll need to take out the cooking grate from your grill. Then, fill your Chimney Starter all the way to the top with charcoal (you can use less if you aren’t cooking as much food). Set the lighter cubes on the charcoal grate and light them. Then you’ll need to set the Chimney Starter directly on top of the lighter cubes, on the charcoal grate. The fire from the cubes will begin burning the charcoal and the flames will grow upwards from there. Depending on weather conditions, in about 10 to 15 minutes the coals should be sufficiently lit to pour into the grill. You’ll know the coals are ready when the ones on top have started to turn a bit gray with ash. Now it’s time to pour the coals onto the charcoal grate, and arrange them based on whether you are going to cook over direct or indirect heat. Once the burning coals have been arranged to your liking, set the cooking grate back into place, put the lid on, and once the grill has heated up sufficiently you’ll be all set to cook. It should take about 10-15 minutes to reach 500-550°F, at which point the grill is considered pre-heated. Now, adjust your lid and bowl dampers to achieve the cooking temperature you desire. Also, remember to put that Chimney Starter somewhere safe once you’ve poured the coals into the grill, you don’t want pets or guests bumping into it while it’s still hot. For those of you with a Weber Performer (with gas assisted electronic ignition) the Chimney Starter can be used in conjunction with the Touch and Go™ electronic ignition system to get the coals going even faster. To do so, all the previously mentioned instructions apply, just make sure the Chimney Starter is placed directly above the burner tube, and follow the Touch and Go electronic ignition instructions. But wait, you've got a smaller grill? 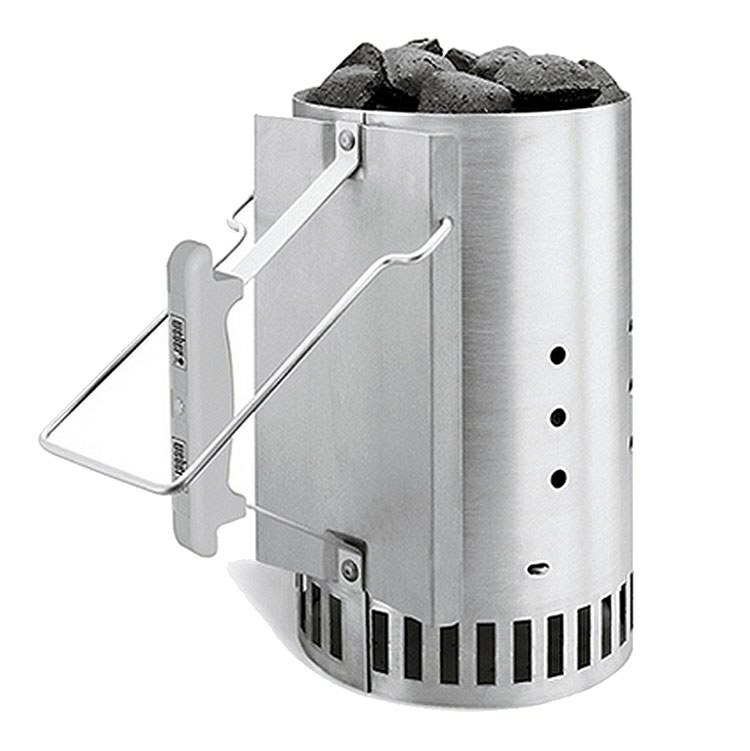 We have a compact version of the Chimney Starter that works great with our smaller charcoal grills, like the Smokey Joe. It makes a perfect addition to anyone’s list of tailgating supplies. Simply put, nothing gets coals burning faster and more evenly than a Rapidfire Chimney Starter. I’ve gotten a real kick out of watching my friend’s faces when they’ve seen me use it in front of them for the first time, and they always tell me that they are going to get one before the next time they grill. As for myself, there hasn’t been a single day when I’ve missed using lighter fluid.